Google’s featured snippets (known to some as “answer boxes”) have been around for a few years now, and while they are nothing new, featured snippets do represent a growing force in SEO. What is the highly coveted position known as Position Zero? It’s the spot that featured snippets hold on the Google search results page. Ads are still up top, followed by a featured snippet, then maybe a “People also ask” box, and finally the organic search results. Depending on a user’s monitor size and settings, “Position One” may be below the fold. On a mobile device, you can almost guarantee organic results will be below the fold when all these other elements are present. As you can see in the following screen shot graphic, Position Zero is higher up on the page than a traditional search result — and hence, more likely to be seen and interacted with. Highly desirable. 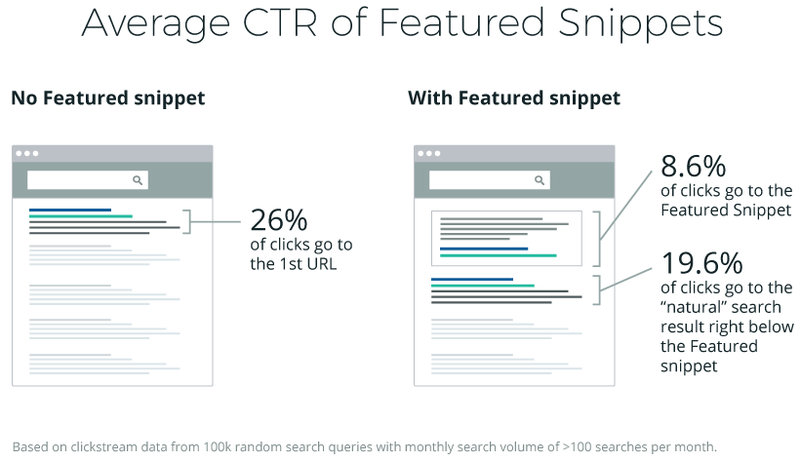 When Google first launched featured snippets, many in the SEO community feared that snippets would cause click-through rates to drop. However, many sites have seen the opposite effect. HubSpot, for example, has seen a 114% increase in click-through rates for 5,000 high volume keywords thanks to featured snippets. The challenge many marketers now have is how to get their content to show up in a featured snippet spot. 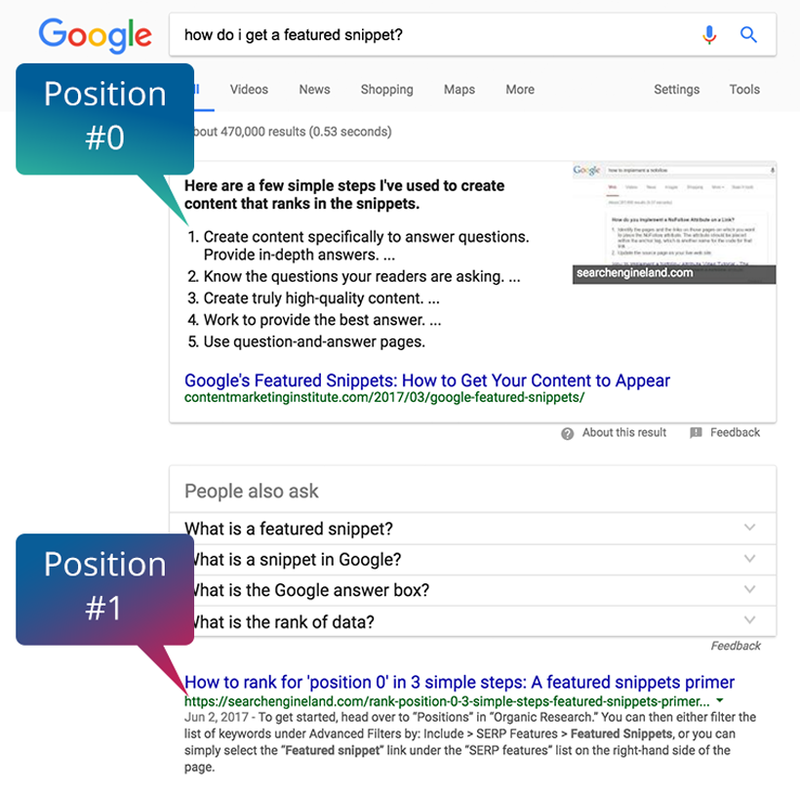 Even searching the question itself, “How do I get a featured snippet?” displays a featured snippet on Google. Although it is a bit like going down an ‘Inception’-like rabbit hole of SEO, it does give you a hint as to the types of content Google wants to promote in Position Zero. And that is… content that answers users questions. Focus on a question that you can answer with strong, useful content. Prepare your page so that the search query (how do…, what is…, etc.) appears in a header (h2, h3, etc.). Craft a brief answer to the question that is roughly 320 characters including spaces (or 50-55 words), which matches the new maximum length for meta descriptions that Google implemented in December 2017. Also ensure the copy of your answer is captured in a <p> tag directly after the header that features the search query. Don’t put an image or other embedded asset between the header and the answer copy. Consider adding an ordered list or the word “step” to subheadings to outline a sequence of actions for a chronological list of steps to appear (Step 1, Step 2, and so forth) in the snippet. Work on SEO basics to get your target page to show up on Google’s page one. The majority of featured snippets already hold one of the top five positions in search. As SEO content editor at Ranker.com, Justin Hussong spends his days trying to uncover the smartest ways to get crowdsourced content seen — and engaged with — across all genres. He shared the following advice with ClearVoice given the ever-changing world of SEO. In 2018, quick answers are most definitely in. Time is the ultimate asset, and this is especially true when it comes to search. This means optimizing your content for featured snippets and voice search, i.e., long-tail keywords that relate more to a conversational tone and solve very specific questions. One of every five searches now come from voice, and this will only continue to grow. Do a little digging. It’s likely you’ll find an available opportunity that is relevant to your website or business. I had a client in the organic food industry, and we found a featured snippet opportunity for a specific ingredient and then decided to create a long-form, comprehensive blog post containing recipes made with said ingredient. We were able to push it up to the featured snippet within a week! To fine-tune your approach on this front, Hussong suggests using SEMRush’s Keyword Magic Tool to search for featured snippet opportunities. He also suggests you get creative on how to identify the best way to mine — and ultimately capitalize on — these unique opportunities. 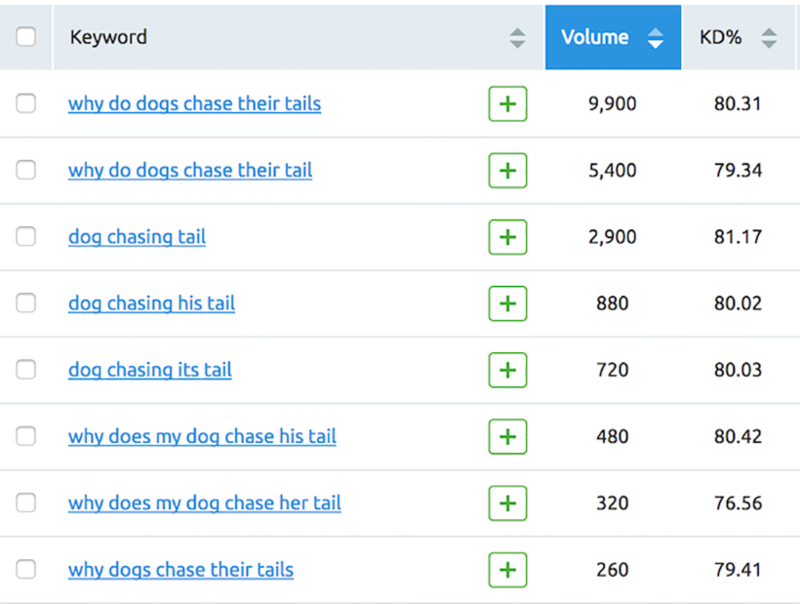 Here’s an example of how a keyword search can lead to the most common phrasing when it comes to solving a very specific question. Notice the ever-so-slight variation between the search terms. Before you start editing or creating pages to improve your featured snippet chances, note that not every site enjoys an increase in click-through rates (CTR). Why? The answer is simple. Because the purpose of featured snippets is to deliver answers on the spot, right on the search results page. Does that mean you shouldn’t try to improve your content to capture a snippet? No, of course not. After all, Position Zero can give your brand more visibility and awareness – it just may not result in better click-through. 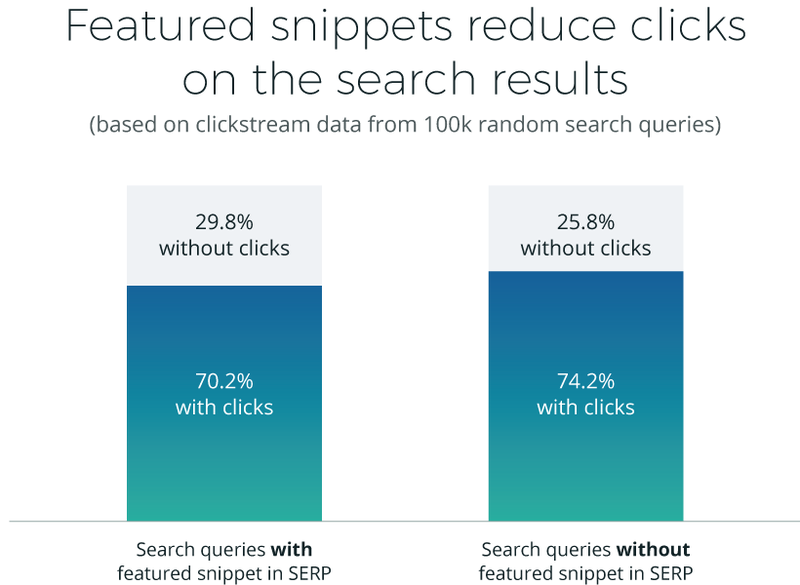 On the topic of whether or not featured snippets increase the number of clicks, Tim Soulo, head of marketing and product strategy at Ahrefs, shared details on a recent study his firm conducted on featured snippets. Soulo says that Ahrefs’ findings might surprise you. When a featured snippet appears on the search engine results page (or SERP), it gets around 8.6% of clicks. However, a page ranking at organic “Position One” — further down the page, revealing less information about the finding — gets a superior 19.6%. Additionally, when there’s no featured snippet on the search results page, Soulo cites that the Position One result gets 26% of all clicks. Bottom line: If users get what they need via featured snippet, there may be no need to click-through – not necessarily a bad thing. Remember the goal of featured snippets is to provide instant information and answers to searchers. Obviously, instant information reduces the need for a user to even click. With that said, featured snippets are not to be feared. Just approach your pursuit of featured snippets understanding the type of results you may see when you get one. In some cases, you will see an increase in clicks. In other cases, you may only get an increase in awareness, harder to measure but still valuable.